HBOT (Hyperbaric Oxygen Therapy) is merging as an advancement in treating diseases such as wounds, infections, Alzheimer’s and infertility to help towards healing. This is such a great advancement that can help many people today and is likely to grow in these types of devices. HBOT is widely being used especially with people who have diabetes due to the complications of poor circulation which in many cases leads to loses of limbs. The patient inhales the oxygen which stimulates the atmospheric pressing of being 33 feet below sea level and boosts the body’s natural healing process. Recently this type of therapy has been used as an alternative for various conditions like infertility and Alzheimer’s disease. HBOT helps provide more oxygen to the body’s tissues so they could work efficiently. Additional oxygen can enhance the healing of damaged tissue, boost tissue function and fight infection. It is an exciting time for medicine and look forward to seeing this treatment heal and save many more patients. Oxygen is fast being recognised as one of the most powerful agents available to medicine. The therapeutic use of oxygen under pressure has been used to assist wound healing for almost 40 years. It was first used to re-compress divers in the 1930s, and was developed to complement the effects of radiation in cancer treatment in the 1950s. Within a few years it was being used to support patients undergoing cardiac surgery, and to treat gas gangrene and carbon monoxide poisoning. Pressurized oxygen was first used to assist wound healing when it was noted in 1965 that burns of the victims of a coal mine explosion, treated with it for their CO poisoning, healed faster. In spite of this long history of therapeutic use, the mechanisms of pressurized oxygen are still being discovered and the medical use of oxygen under pressure is still an evolving speciality. In wound healing, hypoxia can be defined as an insufficient supply of oxygen to allow the healing process to proceed at a normal rate and it is possible to have hypoxia in one area of a wound and not in an adjacent area. 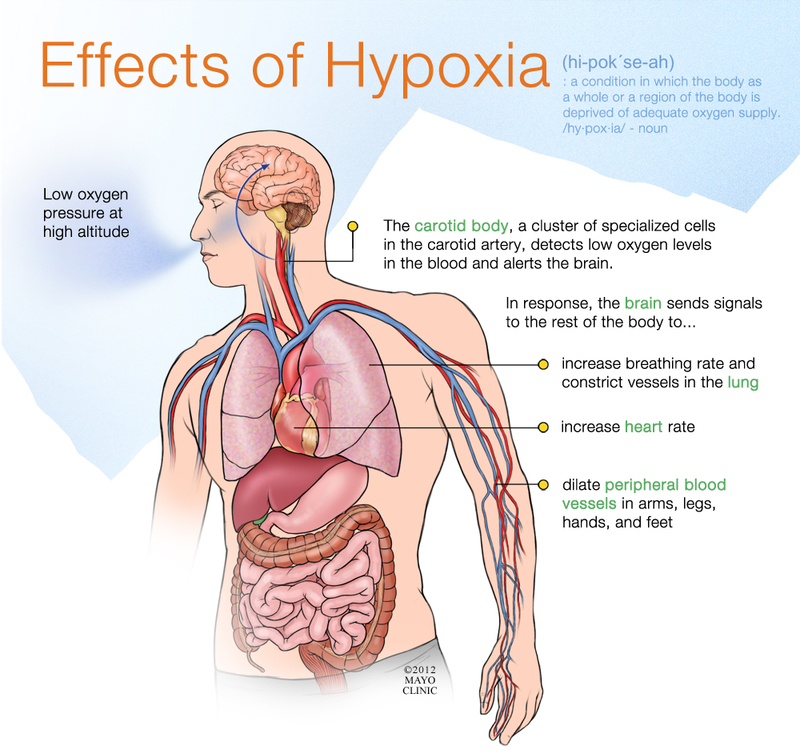 Not all effects of hypoxia are bad and in fact all wounds initially have areas of hypoxic tissue. It actually causes several wound healing processes to occur but when hypoxia is severe, prolonged or widespread it can cause tissue cells to die and the wound can worsen and have effects on other parts of the body. The capillaries can become leaky and oedema accumulates and blood circulation can become compromised. Surgery or medicine can re-establish circulation which sends blood to the ischaemic area, providing new oxygen substrate for the formation of more free radicals, with the result that the injury temporarily worsens. In massive injury the release of inflammatory cytokines and free radicals are high enough that it can lead to multiple organ failure. Therefore a catastrophic chain of events can be initiated by oxygen deprivation. When used in wound healing pressurized oxygen is administered as a short pulse of oxygen – 90 minutes in a 24-hour day. Although the elevated amount of oxygen is only for a short time, the numerous other effects of pressurized oxygen carried on affecting and treating the wound after the treatment has stopped. At elevated pressures the harmful effects of gas bubbles in the tissue are minimised. The vasoconstrictive effects can be used to good effect and causes a significant reduction of oedema, which has been shown to be beneficial in re-perfusion injury, crush injury, compartment syndrome, burns and wound healing. High levels of oxygen can diffuse into the wound which may otherwise be restricted if administered via the blood due to oedema or if blood vessels to the area have been damaged. It is also capable of increasing the number of cytokines and many growth factors important to wound healing. Pressurized oxygen also aids in the prevention of infection by not only the killing of bacteria, by aiding in providing an oxygenated environment which would kill of anaerobic organisms and increases the production of neutrophils which aid in also destroying bacteria but by also aiding and increasing the effectiveness of administered antibiotics. Therefore pressurized oxygen has the potential to be used more widely in the future to aid in the healing of severe wounds and burns, as it has been proven to have reduced morbidity and infection, increases the healing process and reduces the extent of tissue necrosis and prevents further systemic problems in the body normally associated with severe wounds.